SINGAPORE—When Listri Samudra, an equity sales representative in the Indonesian city of Bandung, opens her smartphone to connect with her clients, she has three messaging apps to choose from. She usually prefers BlackBerry BB.T +6.81% Messenger, which remains highly popular in Indonesia, but also often uses WhatsApp—the company Facebook Inc.FB +0.25% recently agreed to buy for $19 billion—or Line, a Japanese app that is rapidly gaining ground in the region. The crowd of free messaging apps on Ms. Samudra’s phone illustrates why Southeast Asia is shaping up as an important battleground for messaging app makers. The region, in which no clear messaging leader has emerged, is critical, in part, because many of its roughly 600 million people have yet to upgrade from basic cellphones to smartphones. That means consumers’ preferences for such apps are malleable, and because most people lack Web access elsewhere, their devices could represent their main gateway to the Internet. Data from researcher Nielsen shows about half of Thailand’s mobile-phone users own smartphones, compared with just 23% in Indonesia and a mere 15% in the Philippines—much lower than China’s 71% smartphone penetration. Indonesian smartphone users have an average of 4.2 messaging apps installed on their phones, according to a 2013 survey by On Device Research, twice as many as in the U.S. Most of the apps jostling for space on Southeast Asian users’ smartphones are little known in the West, though they already have millions of users in the region.Naver Corp.’s 035420.SE +1.29% Line, Tencent Holdings Ltd. TCEHY -0.54% ‘s WeChat and Kakao Corp.’s KakaoTalk have become mainstream. Lesser-known apps also making inroads in the region include Cyprus-based Viber, a company that Japanese e-commerce giant Rakuten Inc. 4755.TO -0.31% agreed to acquire for $900 million in February, and Vietnam’s Zalo, which has gained 10 million domestic users since its 2012 launch. Even if the apps are generally free, the business can be lucrative as many regular users end up purchasing additional services such as virtual goods for games and “stickers,” or cartoon images that can be sent as messages. 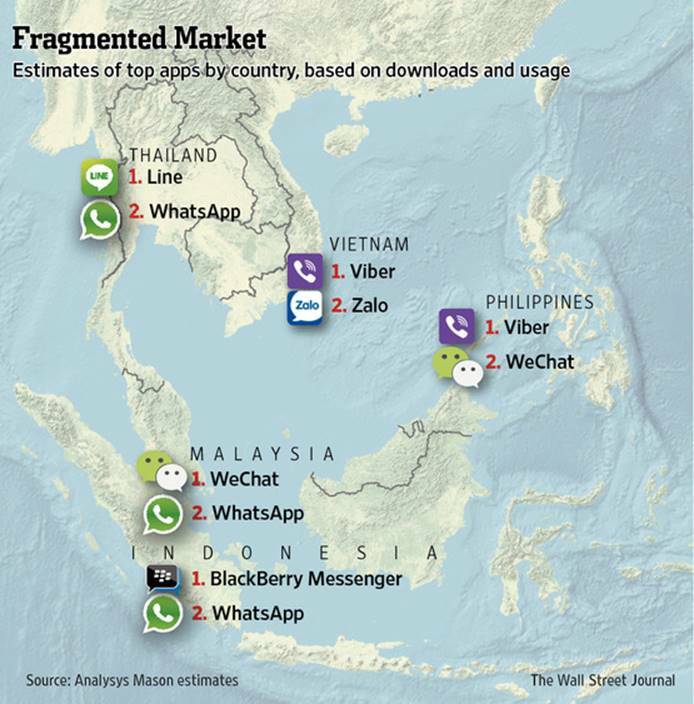 While Silicon Valley-based WhatsApp is the dominant messaging app globally with more than 500 million monthly active users, it has struggled to gain traction in some parts of Southeast Asia, partly because competing apps are going out of their way to cater to local tastes. In Thailand, for example, Line overtook WhatsApp as the country’s most popular messaging app last year, helped by a local advertising push and special stickers tailored to the market, analysts say. Line says it has 450 million registered users globally, including 27 million in Thailand. In Indonesia, where it has 20 million users, Line has customized some of the stickers featuring its cartoon figures to appeal to a Muslim population. During Ramadan, characters were featured praying or celebrating with fireworks. “What we try to do is to localize and pay attention to detail, optimizing our services for the user’s country,” said Line Chief Operating Officer Takeshi Idezawa in an interview. Parent company Naver is considering a public listing that could value it at over $9.8 billion. China’s WeChat, which relies on stickers and videogames to generate revenue, has focused on locally tailored promotions to add to its 396 million global monthly active users, said Poshu Yeung, vice president of international business at parent company Tencent. In one of WeChat’s promotions in Malaysia, users who follow the official WeChat account of Chatime—a teahouse franchise—can receive discounted drinks. In Indonesia, WeChat sponsors television programs like “Indonesian Idol” and a dancing competition show. Tencent doesn’t disclose market share by country or exact revenue figures for WeChat, but said it generated between 200 million and 300 million yuan ($32 million and $48 million) in the fourth quarter last year. WeChat is the most-used messaging app in Malaysia, and among the most popular in Vietnam, Indonesia and the Philippines, said Tom Mowat, head of Asia-Pacific research at advisory firm Analysys Mason. BlackBerry Messenger, the messaging app of struggling smartphone maker BlackBerry Ltd., is still number one in Indonesia, where its devices have traditionally been popular, Mr. Mowat said. But even the app’s devotees, like Ms. Samudra, have begun embracing the likes of WhatsApp, Line and WeChat. BlackBerry in May kicked off its first global handset launch in Indonesia, offering a new low-cost smartphone in one of the company’s last global strongholds. Messenger, which BlackBerry considered spinning off last year, still has 85 million monthly active users globally, but it is no longer among the top apps outside of Indonesia. Meanwhile, Rakuten’s Viber has become popular in Malaysia, the Philippines and Vietnam with its features offering free texting and phone calls. The company says it has more than 300 million global users. “Southeast Asia is an extremely important region for Viber,” said the company’s chief executive, Talmon Marco, citing the region’s large population and growing smartphone penetration rates as critical factors. Viber sells stickers and credits to make calls to non-Viber users, but the company has yet to turn a profit, losing $29.5 million in 2013. Sirgoo Lee, KakaoTalk’s co-chief executive, said recently that his company is focusing on Malaysia, the Philippines and Indonesia as its next markets for growth after its messaging app gained popularity in Korea. KakaoTalk, which has 150 million registered users, offers games, sells stickers and generates some revenue by allowing celebrities and brands to send messages to their subscribers. In Vietnam, Le Hong Minh, chief executive of VNG Corp., which developed Zalo, said his service attracts users through mobile, print, and broadcast advertising, along with celebrity promotions. But unlike its rivals, Zalo remains focused on its home country for now. The app is available only in Vietnamese, offers locally tailored stickers, and plans to make money from advertisements displayed within the app, said Mr. Minh. “The key message we deliver” is that “Vietnam can have its own messaging app,” Mr. Minh said.